Chris, tailgating with Sir Wreginald, King of the Tailgates is quite fun! 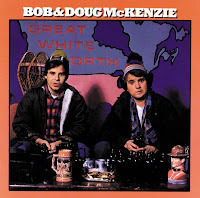 If you're lucky, maybe I'll bring Bob and Doug McKenzie along. You hoser. I have to get my hands on a Broncos flag! Don't let his youth get the better of you, you know kids these days! Make sure he buys ALL the beer.